It has been the final week of February and the weather is turning warm. Moving forward, instead of dwelling to the cold season, I think it is wise to prepare for our Summer OOTD's and must-have things. Enough of sweaters and dark clothes for it is right moment to look lively, fun and young. For today's layout, I want to express the youthfulness of Summer. If I were to ask, I will grab the shirt from River Island and partner it with a pastel pair of shorts from Topman to feel comfortable. 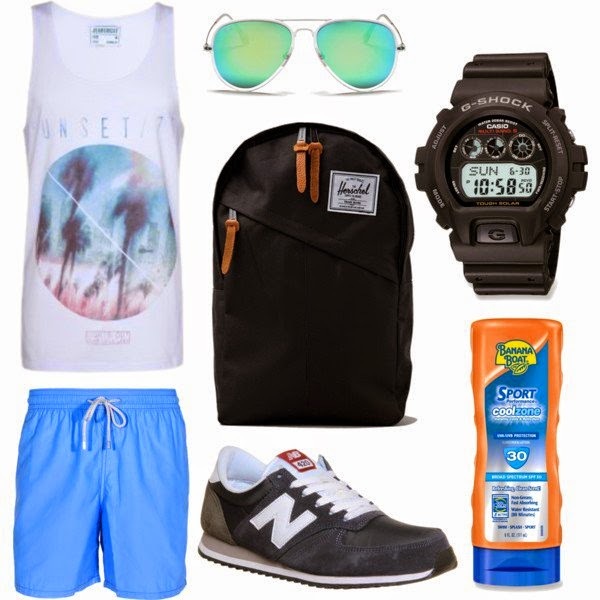 During my summer getaway, I always love to travel light and walk a lot so I'd go with a good pair of shoes from New Balance, a pair of sunglasses from Ray-Ban plus a well-organized backpack from Herschel. Watch is a necessity for traveling, so I will recommend a G-shock watch from Casio. As you hydrate yourself with water, it is always a must to apply a sunblock. Banana Boat has been my childhood sun protection lotion. Based on my experience, it's really effective. Want me to come with a product review for it? This time will be the kickstart of Summer. Grab your gears, budget your moolahs and plan your summer vacation well. Do not forget my suggestion as you go along with your Summer OOTD's, okay? Thanks for dropping by! I saw that same shirt from River Island earlier. Great ensemble. Sure you'll feel comfortable with this. I love G-shock! I remember being given one the first time it came out, it was pink and it would've been perfect, except that it was a fake. The kind you buy in the sidewalk, hahaha. Summer - I have a love/hate relationship with this season. I love it because it means I can wear lighter clothes, go to beach, or plunge in a cold swimming pool. But I hate it because that means it's hot all day. I have to turn on the AC which means high electric energy consumption again. Hello, high Meralco bills. Just like you, I am feeling the same way with Summer but since we cannot stop the season from going there, let's just enjoy the fun! Perfect look for summer to come. My boyfriend would dig this look. This got me excited for summer. The G-Shock looks so cool. wow nice summer get up! my hubbie should try this as OOTD! Love the graphic shirt!I almost forgot that summer's near. So excited! Great coordination there. Like the New Balance sneakers especially, they're all the rave now in Singapore. Awesome. It's actually one the trend here in the Philippines too! look like it's a good combination. it's really needed to get a high spf lotion . It is actually a must! HAHA! You are so lucky the weather is warm where you live. Here in the Eastern part of the United States is freezing cold. Really cool outfit selection!!! You're right, it's beginning to feel warm. I like the sunglasses you featured above. SO stylish. RayBan sunglasses! Are those aviators?